Petroleum Minister Veerappa Moily�s statement on the eve of Gujarat Assembly poll that cap on LPG cylinders would be raised from six to nine annually has drawn the ire of the Election Commission. The commission today took strong exception to the reported statements by Moily. Under attack from its supporters and the Opposition on providing reservation for Scheduled Castes/ Scheduled Tribes in promotion and on retail major Walmart spending huge money on lobbying to gain access to Indian markets, the UPA government woes continued for the second day in Parliament on Tuesday. 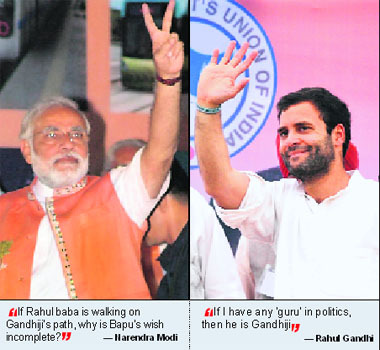 Rahul Gandhi and Chief Minister Narendra Modi sparred today after the Congress leader invoked Mahatma Gandhi, as the Gujarat war hot up on the last day of campaigning for the first phase of the Assembly elections. AICC general secretary�s attendance in the Lok Sabha was also questioned by Modi after he lamented the short duration of Assembly sessions in Gujarat. The Punjab-Punjab connect, set to happen with Pakistan Punjab Chief Minister Mohammad Shahbaz Sharif�s visit, is expected not only to bridge people-to-people ties between the two Punjabs but also the two nations, as the visiting dignitory meets Prime Minister Manmohan Singh on December 16. The Shiromani Akali Dal�s recently published directory of district-level leaders kicked up a storm on Tuesday, with Punjab Pardesh Congress Committee chief Amarinder Singh alleging that leaders mentioned in it enjoyed �immunity� from police action if found indulging in any criminal activity. Four workers were killed and eight others injured when a school building under construction caved in on the premises of the posh SRS Residency Towers located in Sector 88 today. Continuing its crackdown on sports federations that have not strictly followed the sports code in the conduct of their elections, the Union Sports Ministry today set aside election of the president, secretary general and treasurer of the Athletics Federation of India (AFI).